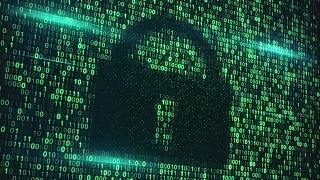 Important security changes that could affect you. Kotapay takes web security seriously. If you arrived at this page from a warning notice while logged in, you could be seriously impacted if you don't make changes. Note: "Check My Security" just checks your operating system and web browser. If your ACH software doesn't use your web browser, it can't check it with this tool. Using Windows Vista will require installing another web browser like Chrome, Firefox or Opera. If your software uses a browser control to access our web site from within the software page, you may need to update to an operating system newer than Vista. Contact your software vender for more information. Using Server 2008 will require installing another web browser like Chrome, Firefox or Opera. If your software uses a browser control to access our web site from within the software page, you may need to update to an operating system newer than Server 2008. Contact your software vender for more information. Android 4.4 (Kitkat), Android 5.x (Lollipop) or greater. Apple OS X 10.7 or greater. Apple iOS 5.0 or greater. Other OS? See this (very technical) page for more information. Edge, the default web browser included with Windows 10. Supports Jolokia without additional browser plug-ins. Internet Explorer 11 or greater for Windows 7, Windows 8.x, or Windows 10. Internet Explorer 10 running on Windows 7, Windows 8, Server 2008 R2 or Server 2012 may need to have a check box checked in Internet Options. (See "troubleshooting" section below for details.) Supports Jolokia without additional browser plug-ins. FireFox 38 or greater for all platforms. Legacy plug-ins (required to run Jolokia) no longer work with Firefox 57 or higher. Google Chrome 43 or greater for all platforms. Browser plug-in required to run Jolokia. Opera 30 or greater for all platforms. Apple Safari 8 or greater for Apple OS X or iOS. Other browser? See this (very technical) page for more information. Internet Explorer, Firefox, or Opera, under the "Help" menu (if the menu isn't visible, press the "Alt" key first), choose "About..." to see the version. Chrome, click the "hamburger" icon ≡ on the right, near the top, then choose "About Chrome". For the best security and performance, you should always install the latest version of your preferred web browser. Using a framework not listed? See this (very technical) page for more information. Kotapay support can check your session logs to see if you are compliant. Computers that don't meet the above requirements will not be able to access our secure web pages or services. Your web browser says "PASS", but you get a "FAIL" when uploading files via your software. If you use Chrome, Firefox (or any browser other than Internet Explorer on a Windows platform), and your OS is Windows 7 or older, your problem may be Internet Explorer, which is often used by software that displays our website in a window. Make sure you have the latest version of Internet Explorer. Make sure TLS 1.2 is enabled in Internet Options. See this pic for details. You must restart your browser for this change to take effect. 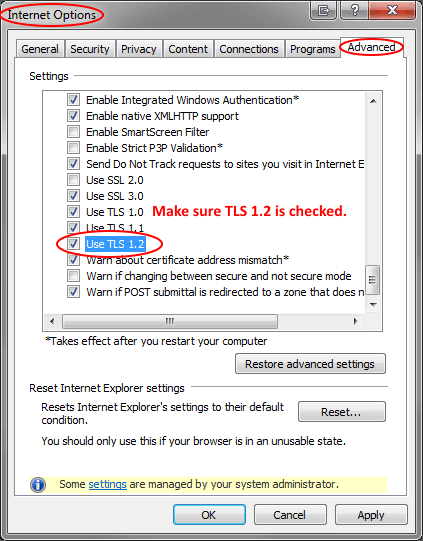 The TLS 1.2 checkbox is checked on Internet Explorer and yet you still fail, or you fail intermittently when using Internet Explorer. Disable or uninstall any web browser toolbars. Search toolbars are often installed when installing free software and often are unwanted or unused and may cause instability. From IE, click the "View" menu to disable any toolbars you don't use. If you don't use those toolbars, uninstall them from "Programs and Features" in Control Panel. For more information, visit Manage add-ons in Internet Explorer on Microsoft.com. Turn on Enhanced Protected Mode. Enhanced Protected Mode adds additional security and disables most toolbars and browser helper objects. (Click for more information on EPM from Microsoft.com.) From Internet Explorer, click "Tools" menu... Internet Options... Advanced tab on the top right. Scroll down to the "Security" section. Check the checkbox for "Enable Enhanced Protected Mode". You may have to restart your computer for the change to take effect. Reset your browser. Resetting Internet Explorer will disable any toolbars, add-ons or settings, but you will lose your settings. From Internet Explorer, click "Tools" menu... Internet Options... Advanced tab on the top right. Then click the reset button towards the bottom. Leave the "Delete personal settings" checkbox unchecked, then click "Reset". Scan for malware and remove anything questionable. This is something you should already be doing. What else doesn't work? Maybe it's related to this problem. If all else fails, call a network or IT tech to fix it.